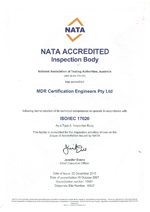 NATA is the authority responsible for the accreditation of laboratories, inspection bodies, calibration services, producers of certified reference materials and proficiency testing scheme providers throughout Australia. It is also Australia's compliance monitoring authority for the OECD Principles of GLP. NATA provides independent assurance of technical competence through a proven network of best practice industry experts for customers who require confidence in the delivery of their products and services. NATA formally recognises that these facilities produce reliable technical results which make the world a safer and more certain place. NATA's work increases community confidence and trust in a facility's services, mitigates risk, improves tendering success and facilitates trade. MDR are accredited with ISO/IEC 17020 and 17025. See below certificates.